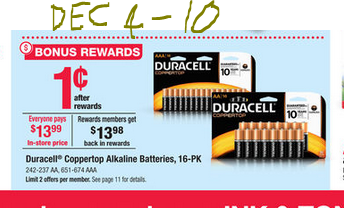 This is turning into a battery blog 🙂 Good until the end of the year (12/31/16), Office Depot and Office max brick and mortar stores and their website are offering the 1c Duracell Batteries after Office Depot Rewards. The limit is two per customer per week across all purchasing platforms (online, in-store, by phone or fax or telegram or raven). The week is defined as Sunday AM until Saturday PM. If you are buying online avoid the overlap between late Saturday PM to early Sunday AM to prevent time-change and website maintenance issues. You can find these online as well, shown at the Office Depot Rewards page. Page towards the bottom to see the terms and conditions (or use your browser’s in-page search feature to search for “Duracell”). Per the terms these will be issued separately from the monthly rewards, which is a very good thing (the monthly rewards are only issued in $10 increments so you typically don’t get all your rewards [sneaky way to avoid paying the full amount of rewards earned). This is a screenshot, View Larger, since the rewards page is not a very responsive design. The terms are the same as before, you buy a 16-pack of single-use Duracell AA or AAA battery. You pay full price ($13.99) plus sales-tax (if collected in your store/state) and you make sure your Office Depot rewards number is on the receipt (or if buying online in your account profile) because that’s how their computer will know to send you your rewards. You don’t need to mail anything or use a coupon. About three weeks later (give or take), you will find $13.98 of Office Depot rewards in your Office Depot rewards account. You may not get an email alert, so don’t forget to check there. This is limit two for the week.